Good morning! Today's post features some multichromatic glitters by Enchanted Polish. 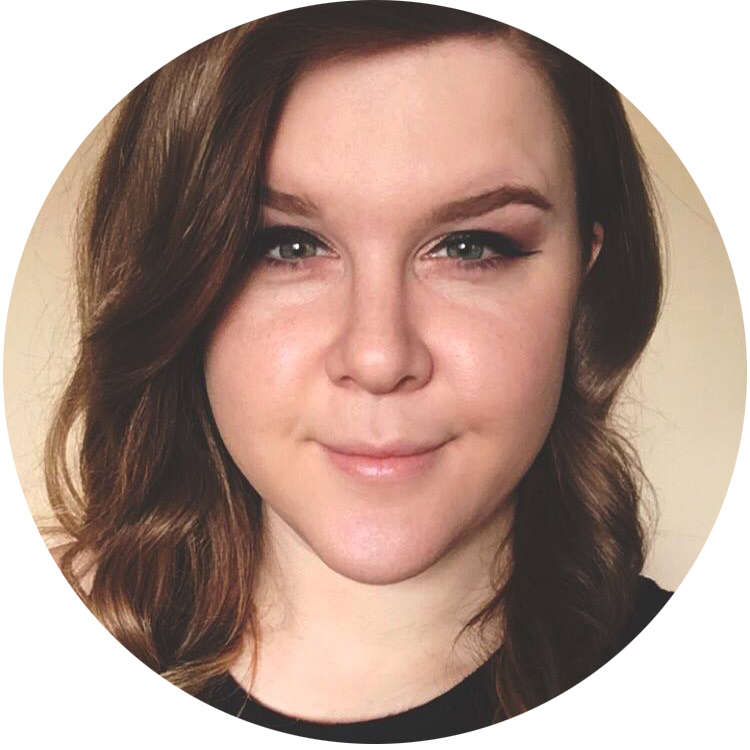 They are STUNNING and require a number of photos to accurately depict what they look like. So prepare for a massive, picture heavy post! All photos show one coat of glitter over one coat of American Apparel Hassid. Don't forget that you can click the photos to enlarge. First up: Ola Rio. This little beauty goes from red to orange to gold. It's extremely vibrant and possibly my favorite in the collection. Maybe I am reacting to how autumnal it is; the weather has just started cooling off here in the desert and I am in the mood for these types of colors. Next up we have Hello New York. This goes from a warm greenish gold color to a cool, blue-toned green. Like Ola Rio, this one is also very dramatic and contrasted over black. I love the warm greenish gold side of its color changing spectrum, particularly. Ciao Milano has lots of colors in its shifting spectrum: green, teal, blue, pink, purple, and even bits of gold at extreme angles. I imagine that many of you will like this one the most out of all of them! Magical and lovely. Finally we have Bonjour Paris. This one had the least contrast when layered over the black. It has a subtle look but you can definitely still see the shifts happening. It goes from a dark midnight blue to a coppery orange color, with flecks of pink and purple. The formula on all of these was the same: easy to apply and very dense. You will most likely only need one coat of topcoat to smooth them out. They are stunners and sure to appeal to many of you! 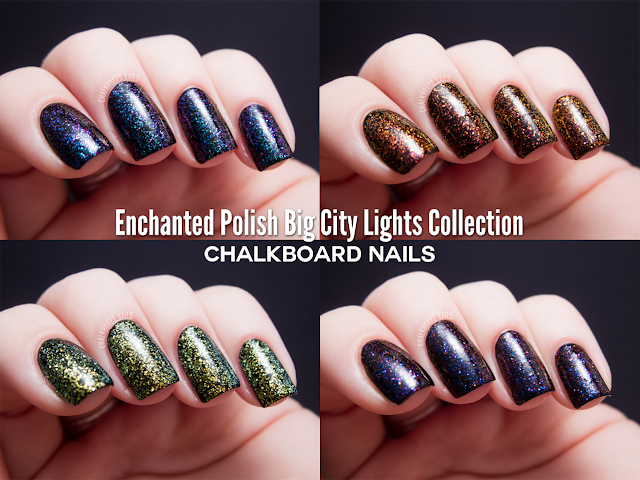 Enchanted Polish is on Facebook, and the Big City Lights Collection is available on enchantedpolish.com, Llarowe, Harlow & Co., and Mei Mei's Signatures. Prices vary per retailer. These are all gorgeous! Ola Rio is definitely my favorite right now, I think i'm still in a loving fall mood. Oh my gosh, they are all stunning! These are infuriatingly pretty. I think I like Hello New York the best but Ola Rio may be tied... I am also soo into fall colors these days. Ciao Milano is entirely my sort of colour! I have to check this brand out! For a SUPER crazy effect, put Hello New York on top of Just Spotted The Lizard. My nails were SUPER blinged out. Bonjour Paris is so gorgeous! Wow! I love these polishes so much! Wow! What else can I say!?!?! WOW! These look so amazing - & you have perfect application as always ! Ciao Milano is my favorite in this collection, but they're all gorgeous! I'm liking these glitters they are gorgeous. Love these shades - and I can actually think about wearing them now too - like you, I have been enduring this really hot, hot fall - hotter than any part of the rest of the yr and it went on and on - I only yesterday was not needing to be in a sundress or shorts for the first time of the season. So glad it's going to cool off and we might even catch some rain which would be fab. Really pretty as I said - I would like to have any of all of these. These nail polishes are all soo pretty!